Buy custom dreamcatchers at a fair and reasonable price from the leading seller of metaphysical products in the Philippines. Adorned with genuine amethyst, a psychic enhancing stone, this dreamcatcher can make your dreams helpful and meaningful. 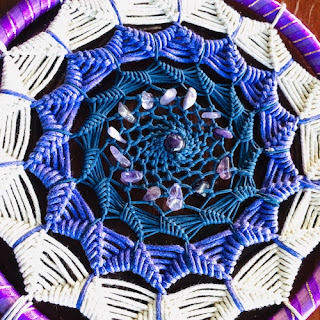 One of the best calming crystals, amethyst also promotes peaceful sleep which makes this dream catcher helpful for insomnia relief. LIMITED OFFER: BUY THIS AND GET A 2ML BOTTLE OF MAGICKAL OIL-BASED PERFUME OF YOUR CHOICE FOR FREE!!! 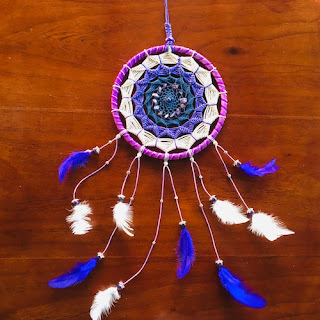 WHERE IS THE BEST PLACE TO HANG A DREAM CATCHER? 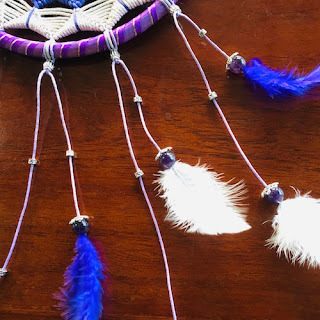 Dreamcatchers absorbs all sorts of dreams, good and bad. The good dreams pass through the net and then slide down the feathers to the sleeping person below. But what happen to the bad dreams? Most of us know that they are trapped in the net. That’s all we know. If that’s the case, dreamcatchers will definitely be filled with negative energies over time and that in turn will have a negative effect on a person. So what should we do to avoid this from happening? Most people don’t ask that question because they don't really understand how this sacred object works. To answer that question, dreamcatchers should be hanged over a bed where the morning sunlight can reach it. This way the light will burn up all the bad dreams caught up in its protective net.